Bomy’s Flutter: touching & FINALLY a HEA for Jolie & Hauk! Worldbuilding: Again we deal with the cool Underlight, the paranormal Ananke, some awesome mythology (and even a Valhalla glimpse! xD). The world of this series is a beautiful mix of elements and it sure keeps you entertained. Characters: Jolie and Hawk have been shown love by myself in reviews of previous installments in this series. While my frustration levels did run high about this pair – so much seemed to be working against them, even themselves in places – my evil reader side has been constantly thrilled. If you expect easy romance and a mushy happy ending here, well, you’ll be left waiting. Jolie and Hawk give us some more of the same side of frustration, their issues have not magically disappeared just because they’re in love (which they are!) or because they FINALLY are together. Or because they get their happy end, which they do. In How Beauty Loved the Beast Jolie becomes an even stronger character, in my mind, while Hawk shows us more of his vulnerable side. Where she’s fierce and demanding in her love, he’s insecure, even shy in places. I loved them together and I really loved how their relationship evolved. Their one on one was very hot but it also oozed emotional connection and tenderness, an awesome mix. Plot: More of the action we’ve already grown used to from Jax Garren, the Ananke are still up to no good and need some head-slapping. Preferably in copious amounts and from Hawk, if you ask me. Aside the action that is lively without becoming overwhelming, the romance arc keeps you on your toes throughout the novel. And it will keep you on your toes up until the very end – that I so loved. You’ll see why when you read it. Writing: Third person narrative, his and her POV. I loved it, as I did in previous installments of the series. Curb Appeal: The cover is gorgeous and the blurb did hook me, but I was already invested in the characters so I would have wanted to read this anyway. I loved How Beauty Loved the Beast and am very happy I read this series. I wasn’t as into the story as I might have expected though everything felt well done and beautifully told, but I blame that partly on my mood. Either way, this was a one-go reading session and I had a lot of fun. All in all, this is a great end to a fun series. 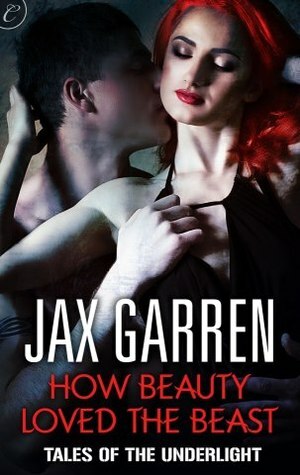 It’s a reinterpretation of the Beauty & The Beast theme, and Jax Garren makes it her own beautifully if you ask me. I recommend the series and look forward to reading more from the author.